This breathtaking hall in one of the world’s most famous landmarks, the Palace of Versailles in France, is a perfect example of French baroque and grand architecture. The main feature of the hall is its seventeen mirrored arches; each arch reflects the windows that look out onto the gardens opposite. The arches each contain twenty-one mirrors, 357 in total in the hall. Marble pillars break up each arch, showcasing gilded bronze pilasters; each pilaster depicts symbols of France such as the cockerel and the rooster. The hall is long and narrow and includes 17 large and 26 small chandeliers suspended from the barrel vaulted ceiling, each chandelier is made of solid silver and altogether features 1,000 candles, the chandeliers were originally installed in 1770 and reconstructed back to their original state in 1980. These luxurious installations line the centre of the Hall, in this era Chandeliers were considered as symbols of opulence and wealth with expensive crystal droplets and solid silver frames. 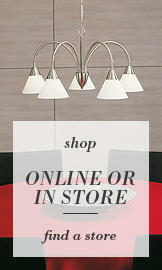 The stunning droplets reflect light around the room and together with the mirrored arches, create a wonderful ambience. 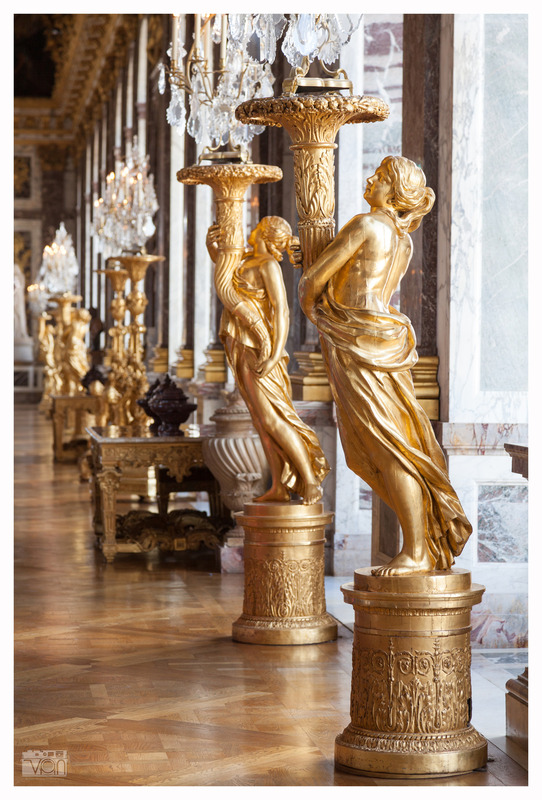 As well as crystal chandeliers, the hall also features a stunning array of statues and gold leaf guéridons holding up gold leaf crystal candelabras, these were reinstated after the original silver table ware and guéridons had to be melted down in 1689 to finance the War of the league of Augsburg. 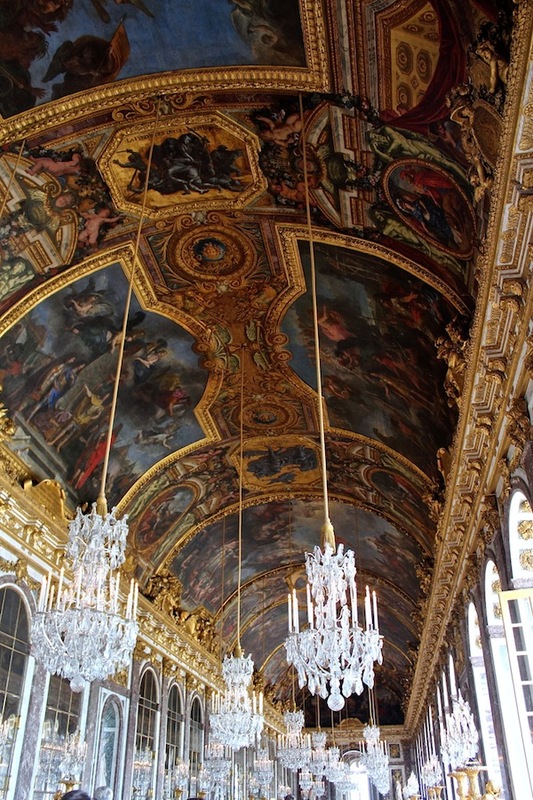 It’s incredibly hard to miss the artwork in the Hall, the ceiling and walls are covered in decorated panels of paintings glorifying the reign of Louis XIV such as military and political victories. 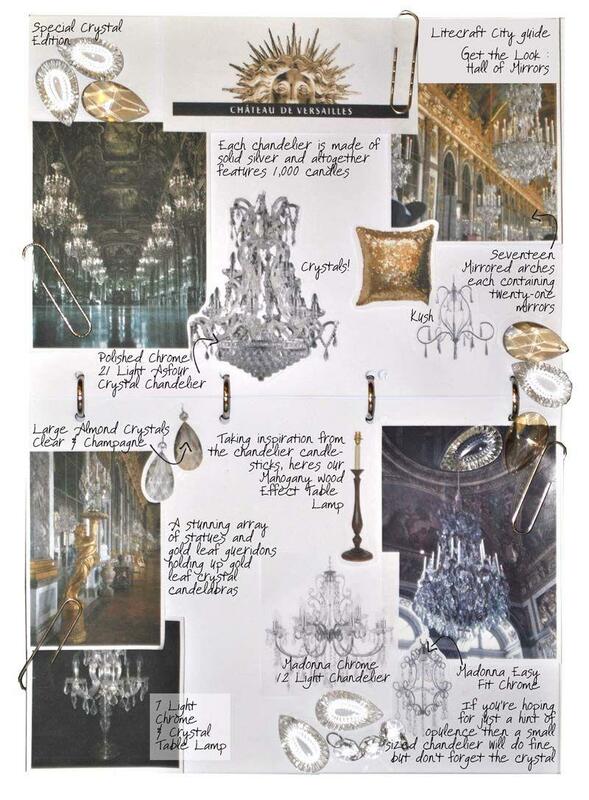 To recreate the fabulous décor of the hall of mirrors, choose extravagant chandeliers featuring crystal droplets and sconces, go over the top with gold accessories and oriental style rugs, the more the merrier. 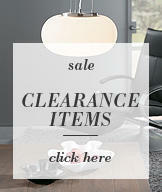 If you’re hoping for just a hint of opulence then a small sized chandelier will do fine, but don’t forget the crystal!